In order to meet the entire requirements of the customers, we are involved in offering best quality of Non Stick Kadai. 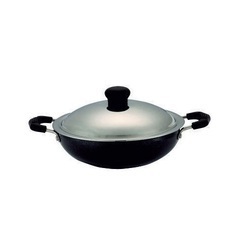 This Non Stick Kadai is frequently used for deep-frying, stir-frying, and making curries. Further, these products are manufactured using high grade material and highly tested for their quality assurance. - Non-stick coating from germany. - Strong and sturdy handle. We have carved a niche amongst the most trusted names in this business, engaged in offering comprehensive range of Non-Stick Appachatti.